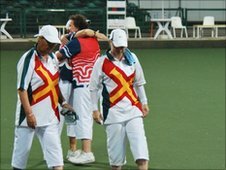 The first Channel Island inter-insular of the 2010 Commonwealth Games saw Jersey beat Guernsey 2-0 in the women's pairs lawn bowls on Tuesday. Jersey's Karina Bisson and Chrissie Grimes came into the match following three defeats. An hour earlier they lost to Wales on a tie-break. Chrissie Grimes said it was a bitter-sweet victory: "It really was important for us, we were totally devastated against Wales." She added: "We played so so well, couldn't have played better then we went down on a tie-break. "We knew we had to do this one, it was bitter-sweet because we got the one but we needed the two." Guernsey's Lucy Beere and Gwen de la Mare had earlier recorded a brilliant win over England, and have now won two and lost two with six games left to play. Beere told BBC Radio Guernsey: "I think the wheels fell off half-way through our game, we got off to a good start in the second set but I don't know whether fatigue was kicking in. "We had just come off beating England and I just felt we were too much on a high, still thinking about that game rather than concentrating on the game we did."